The New York Jets have reportedly acquired cornerback Rashard Robinson from the San Francisco 49ers in exchange for a 2018 fifth-round pick. The former fourth-rounder entered the season as the 49ers’ No. 1 cornerback and played 88.2 percent of his team’s defensive snaps prior to his benching in Week 8. Through eight games, Robinson’s PFF overall grade of 41.8 ranks 104th of 114 qualifying cornerbacks. In terms of numbers, he’s actually been the unit’s best performer, and has allowed just 17 receptions for 223 yards from his 34 targets, with just 34 of those yards coming after the catch. On average, he’s allowed 0.91 yards per coverage snap and a passer rating of just 79.2 on throws into his coverage, both team highs, which rank 40th and 35th of 109 cornerbacks, respectively. However, he’s killed his team when it comes to penalties, and has been called for nine infractions for 93 yards through eight weeks. 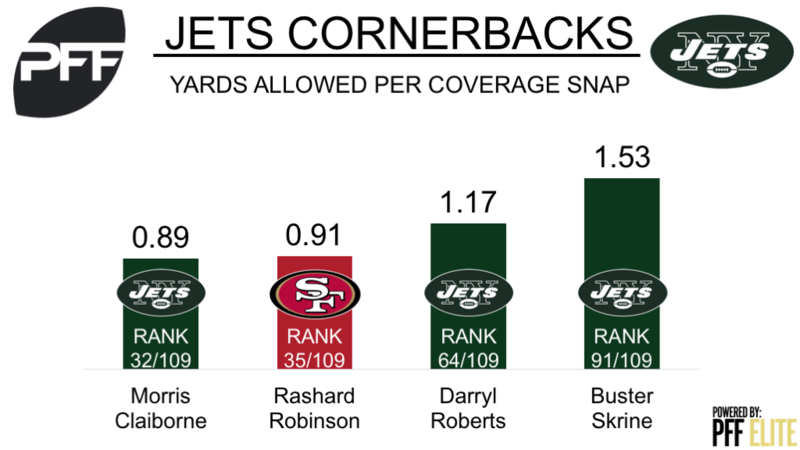 Robinson will add depth to the Jets secondary, and certainly has the potential to push Darryl Roberts for the number three spot. Roberts has played 160 coverage snaps in 2017, and has allowed a passer rating of 93.6 and 1.17 yards per coverage snap, both of which rank 64th among 109 cornerbacks.